Hey there, programming friends! It’s Andy Gesner and the HIP Video Promo staff bringing you a new video from a perennial favorite! In our minds, indie pop veterans of Montreal can do no wrong. We’ve worked with the band since 2005, and the next video they’re bringing to the table is the eighth HIP will be promoting. For years, we’ve seen this band evolve in their musical style and visual impact. Their video for “Coquet Coquette” is no different and acts as a great stepping stone into what of Montreal will be offering up next. It’s hard to expect anything less from of Montreal, who has been around for almost 15 years. When we mention evolvement, just listen to the track itself, which is laden with sharp guitars, actual use of live drums and just a hint of funk and R&B. All the while, of Montreal frontman Kevin Barnes inevitably delivers with his immediately recognizable voice. of Montreal is a Polyvinyl classic for us and simply do not know how to disappoint. Their video for “Coquet Coquette” is another impressive clip, and we’re beyond thrilled that we get to work with the whole team again. If you need more info, call Andy Gesner at 732-613-1779 or e-mail us at HIPVideo@aol.com. 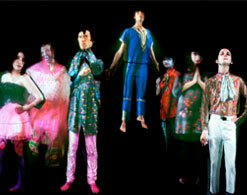 You can also visit www.PolyvinylRecords.com orwww.ofMontreal.net to find out more about of Montreal.